Wishing you a safe and very happy New Year! Cheers and I’ll see you in 2012! I love the combination of flavors in this Sparkling Original Cinn Punch, as created by coworker, Laura. At the forefront of this recipe are cinnamon, apple and vanilla, all accented with a bit of sparkling apple cider. If you’re looking for a last minute drink to serve for your New Years Eve bash, this may just be your new favorite punch recipe! Add all ingredients to a punch bowl with large ice block, adding sparkling apple cider just before serving. Garnish punch bowl with sliced apples. Sprinkle ground cinnamon on top of each individiual glass. Another great quality to this punch recipe is that you won’t be spending a whole paycheck to purchase the ingredients. Most of these items cost under $10 per bottle, including Hiram Walker’s Original Cinn that was included in Serious Drinks’ Best Budget Spirits of 2011. Ring in the new year with this great Sparkling Original Cinn Punch! Peppermint is a ubiquitous, commonplace flavor associated with the winter holiday season. To get in the spirit of the season, I tried combining peppermint schnapps with another all-natural Hiram Walker flavor that remind me of December – pomegranate schnapps. 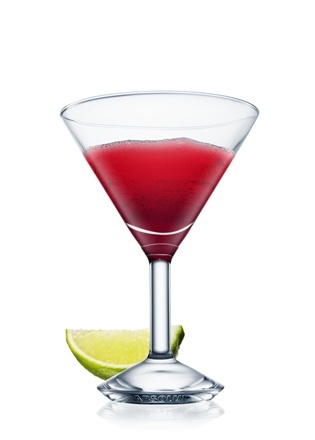 Shake and strain into martini glass, garnish with mini candy cane or mint leaf. But this drink is nowhere near my favorite expression of the uses for peppermint schnapps. My Cocktail Connection features a few of my favorite cocktails using Hiram Walker’s Peppermint Schnapps, such as the Peppermint Patty. If you’re looking for a peppermint cocktail fix, that would be my preferred drink of choice. Peppermint is also a great ingredient to use in a variety of hot beverage during the cold winter months. If you have a favorite Hot Drink that uses Peppermint Schnapps, or a selection of other Hiram Walker flavors, you can enter your drink to the Hot Drink contest of The Quest, Hiram Walker’s search for the country’s greatest cocktail recipes as submitted by consumers. For your chance to win one of two prizes, VISA gift cards valued at up to $500, enter your recipe on Hiram Walker’s website or Facebook page by December 31. Cheers and enjoy what time remains of this holiday season! Topping up a cocktail with a bit of champagne is an easy solution to make a holiday cocktail feel more festive, as with this Sparkly Cosmo cocktail recipe. Yesterday, while out for a office holiday lunch, someone ordered an ABSOLUT Citron Cosmopolitan. It was then I had a realization — a Cosmo would not typically be a drink I associate with a lunchtime drink of choice, but it dawned on me that this really was a perfect cocktail for the occasion. Bright, citrusy, and with just the right hint of sweetness, the Cosmopolitan really is a delightful choice for a holiday cocktail. To further develop upon this concept, I uncovered some unique twists to this classic and universally recognized cocktail. It’s a fun and festive way to flex your cocktail muscles and take a new recipe idea for a spin (you know, to ring in the new year!). 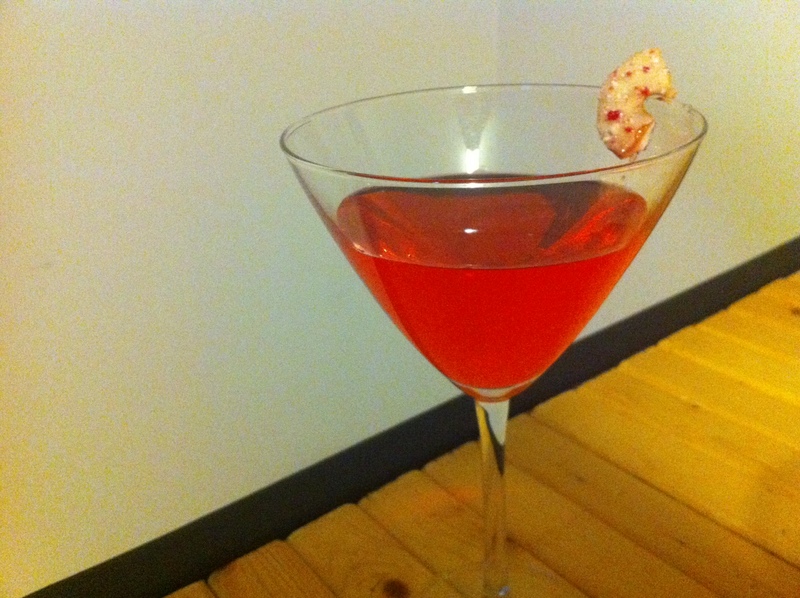 As such, we’re featuring the White Cosmopolitan and the Sparkly Cosmopolitan. I like this White Cosmo for its simplicity in utilizing white cranberry juice in place of the cranberry juice that gives the cocktail its all-too-familiar pink hue. What I think really ties this drink together is the zest of the orange peel, giving it a crisp citrus burst. Fill a shaker with ice cubes. Add all ingredients. Shake and strain into a chilled cocktail glass. Garnish with orange. What more can I say to tease you up for this drink? A bit of champagne bubbly-ness in this Sparkly Cosmo can be just the trick to make a holiday cocktail festive and memorable! Hope these cocktails brighten your season with a bit more holiday cheer, enjoy! Luis Martinez of The Patio (McAllen, TX) displays his trophy for creating the ABSOLUT Best Bloody in America. It’s about this time of year, between all the holiday parties and New Years festivities, that the phrase Hair of the Dog never rings more true (well, unless you happen to be in New Orleans in July when a bunch of other bartenders are in town – but that’s a whole different beast!). The Bloody Mary cocktail has certainly cemented its place at the top of the list of Hair of the Dog libations. But what makes for the best version of this tipple with so many variants and taste preferences? ABSOLUT VODKA and Thrillist.com recently culminated this search through the National Online ABSOLUT Best Bloody in America Recipe Contest. 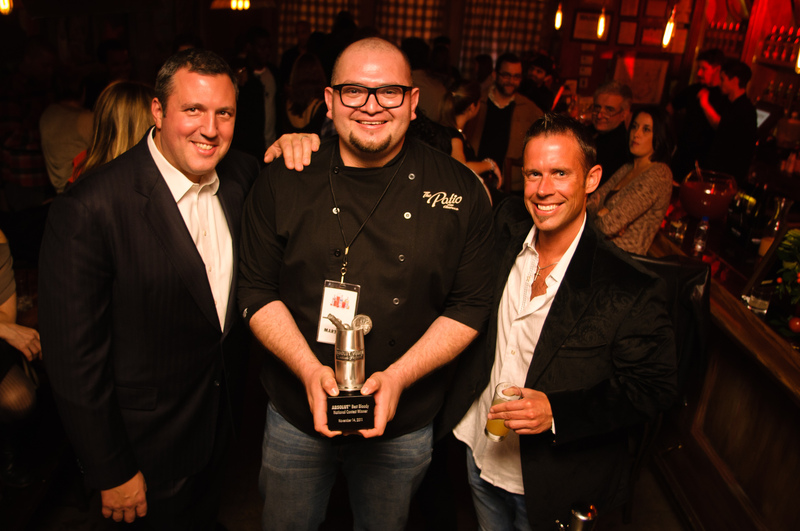 At the program’s inception, 50 bartenders from 50 states were narrowed to a round of finalists where, in a November live finale, Luis Martinez of The Patio in McAllen, TX earned the crown for the ABSOLUT Best Bloody in America. 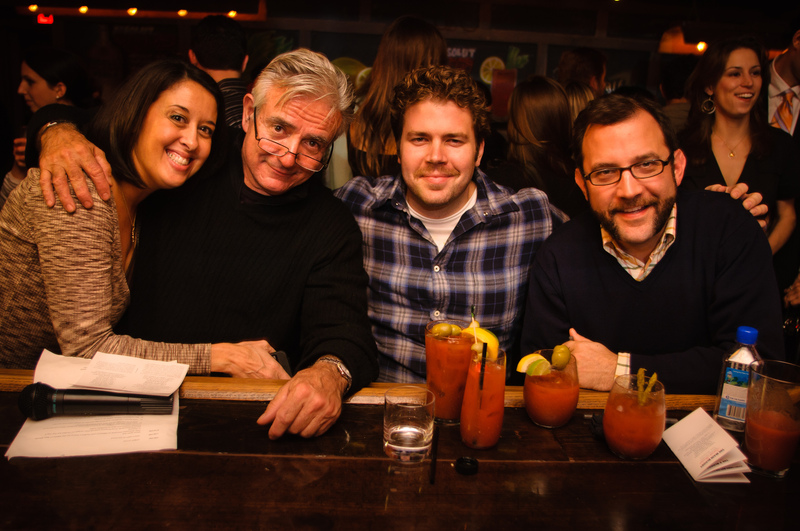 Judging the nine ABSOLUT Bloody Mary finalists at a live NYC finale were Julie Reiner, Dale DeGroff, Ben Robinson and Allen Katz. Mix all ingredients with the exception of ABSOLUT VODKA, tomato juice and lime juice in a shaker tin and lightly muddle them together. In a highball glass rimmed with sea salt, add ABSOLUT VODKA over ice. Add the muddled ingredients and top with tomato juice and lime juice. Garnish with spicy pickled asparagus. Serve ingredients in an espresso cup and top with frothed milk. This is just one of many examples of drinks that can be created and submitted by cocktail enthusiasts in the current cocktail contest for The Quest. In this segment of The Quest, the theme is “Hot Drinks” and entries can include any range of hot beverages (cider, coffee, espresso, hot chocolate) in a cocktail with Hiram Walker liqueurs, brandies and schnapps. You may have a chance to win one of two top prizes for your most outstanding of cocktails – Visa gift cards valued at up to $500. You can learn more and submit your drink by December 31st by visiting The Quest on the web or on Facebook. In the interim, it’s time for me to make another cup o’ Joe. Go, go, caffeine rush!